of "The Andy Griffith Show" Rerun Watcher Club. "Mayberry says, thanks and happy motoring." Friends and neighbors, its my privilege to welcome you to our little corner of Mayberry here on the internet. We are the "Whos Been Messin Up the Bulletin Board?" Chapter ("WBMUTBB?") and we are an honorary chapter of "The Andy Griffith Show" Rerun Watchers Club (TAGSRWC). By honorary I mean that you can be a member of our on-line chapter as well as your local TAGSRWC chapter. All we need to hear from you is a statement saying that you want to be added to our member/distribution list and a short autobiography (First and Last Name, City, and State) on yourself letting us know a little about you so we can get to know our newest "stranger in town." GO HERE for an easy to fill out WBMUTBB Membership Request form. Heres a little about myself. My name is Allan Newsome and I live in Huntsville, AL with my wife, Jan. We were married back in Sept. 1992 and the Lord blessed us with our first child, Adam, on December 19, 1996. Back in the fall of 1990 I was on the Prodigy computer network and I started a "subject" on the Prodigy "bulletin board" called "Andy Griffith Show". After that first message I was joined, over time, by over 57 members. On the first anniversary of that first message, we decided to make our group of TAGS fans a "real" chapter of TAGSRWC so we had people send in their suggestions for a chapter name and "Whos Been Messin Up the Bulletin Board?" (WBMUTBB) was born. I eventually left Prodigy and for about 6 months I was out of touch until in "The Bullet" I saw the e-mail addresses of "WBMUTBB?" members Kevin Johnson and Jack Fellenzer asking for folks to write in. Well I did and, when Kevin graduated from college, the reins to the chapter were handed back to me. "WBMUTBB?" has grown from that small group on Prodigy to include the entire internet and over 1100 members worldwide! 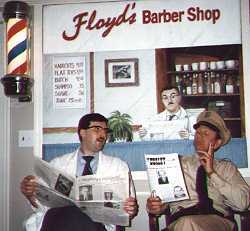 Another section of my life that would be interesting to TAGS fans would be the fact that in 1993, at the encouragement of Barney Fife impersonator David Browning, I began to impersonate Mayberrys own "Floyd Lawson". Yeah, I know that makes me sound like "some kind of a nut" but the Lord has greatly blessed me with the chance to bring smiles and laughter to people in a way I would have NEVER thought I would. In my wildest dreams I never thought Id dress up like a barber and go out in public places signing autographs and having my picture taken. It truly has been a wonderful chance to meet some of the nicest people in this country. Theres just something about TAGS fans; they all seem to share the qualities that they are good, hard working, down-to-earth folks. And yes, I do have a "real job" as an electrical engineer at Redstone Arsenal. I went to college at Auburn University and I'm in my early 30's. Thanks to all of you who have supported me in either the "WBMUTBB?" or the "Floyd" areas of my life. I hope youll all continue to enjoy life here in our little corner of Mayberry. If you don't have a local chapter, you do now. I do encourage you to find a few friends in your area to get together with and watch reruns of the show or just talk on the front porch for a while. If you don't know of folks in your area, write to Jim Clark at TAGSRWC Head Quarters and he'll help you out. Sorry to be so long winded. If you have any questions or comments, please feel free to send them to me. I'd be more than glad to hear from ya'.